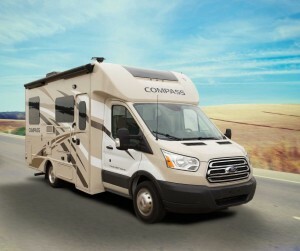 Thor Motor Coach recently reported swift sales and increasing popularity for its 2016 Gemini and Compass Recreational Utility Vehicle series, the first RV models in the industry to ride on the popular Ford Transit Chassis. The models were introduced in late 2015 and launched at the series of 2016 winter RV shows. According to Thor, the diesel-based Transit chassis on the European-styled RUV models not only provide optimum fuel savings, but offer more interior room – up to square 10 feet of space in the front end – as well as easy handling and added features and appointments. Both units are equipped with the Transit’s 3.2 L engine, which offers an impressive 350 pounds feet of torque, compared to a gas engine that delivers 260 pounds feet of torque. According to Thor, this relates to a 35 percent increase in torque at a lower RPM, providing improved power and acceleration when RVers need it. An additional benefit of the Gemini and Compass RUVs include easier driveability and automotive-style handling, whether on the highway or negotiating the tight confines of a campground and during city driving. Well, the Phony Excuses have begun. Gas/diesel prices are up a half buck to 60 cents in the last six weeks or so. Last night the TV news lady said it’s because oil prices have risen 50 cents recently. Gee, and silly ol’ me thought a dollar/bbl increase translated to a couple cents/gal! Truth is, we’re approaching the traveling season and it’s gouge ’em time. And no one ever mentions that here in Colorado, “Regular Unleaded” is only 85 octane. So when we appear to be at the national average, we’re really up to a quarter higher.